Flights are the perfect way to enjoy and compare various saké. All flights are selected by Portland’s only Saké Sommelier. Saké is an amazing beverage that enhances the flavor of food. Being 1/4 the acidity of wine, saké works well with Japanese food and beyond that with cheese, meats, vegetables, and is the world’s best paring with all fish. Saké is 100% sulfite and gluten free. Slightly dry, light, and refreshing with young and vibrant flavors. Subtle hints of citrus and young apples. This is a fun way to enjoy saké…frozen! This is one of the driest saké available in the US — flavor starts off bright and rich then finishes very dry. The rich flavor maintains throughout making this a great food saké. Very soft and mild with rich, savory flavor. Earthy, mellow, very smooth with a long, lingering soft finish. Brewed by a small brewery that brews only premium saké, this Ginjo has a dry, yet bright flavor with hints of light tropical fruit. Soft and round flavor with a hint of blackberry currant in the finish. This versatile saké is extremely light and refreshing. Brewed using old school methods that date back 400 years. Kimoto style saké offers slightly gamey, earthy flavors. This special extra dry saké also has a smokey aroma and finish. Family owned brewery since 1725. Unique saké aged in a cedar tank just like saké of old. Perfect, wood aged flavor that is amazing with food and very popular! Soft, honey-laced nose with a slight fruitiness. Mantensei is dry with good richness and overall balance. Bride of the Fox has a balanced flavor of grilled nuts and honeydew melon with a crisp finish and lingering sweetness. Very dry saké brewed by one of Japan’s most awarded Brew Masters. The Earthy flavor of this saké pairs well with SHO’s kitchen menu. Delicate structure with hints of fresh orange peel and cantaloupe. Beautiful sipping saké brewed in Japan’s leading saké region. This junmai ginjo has subtle mineral and autolytic (biscuit, pastry) aromas with hints of nuttiness and fruit (plum and cranberry). It is medium-bodied, airy and pleasingly floral and musky. It finishes dry with a firm spiciness. Watari Bune is the name of a rare rice that was out of use since the 1920s due to its difficult growing patterns. This brewer revived Watari Bune and is now the only brewery using this rare rice. Deep, layered flavors of honeydew and pineapple with a lingering finish. Brewed with flower yeast and the oldest saké rice in existence, Omachi. 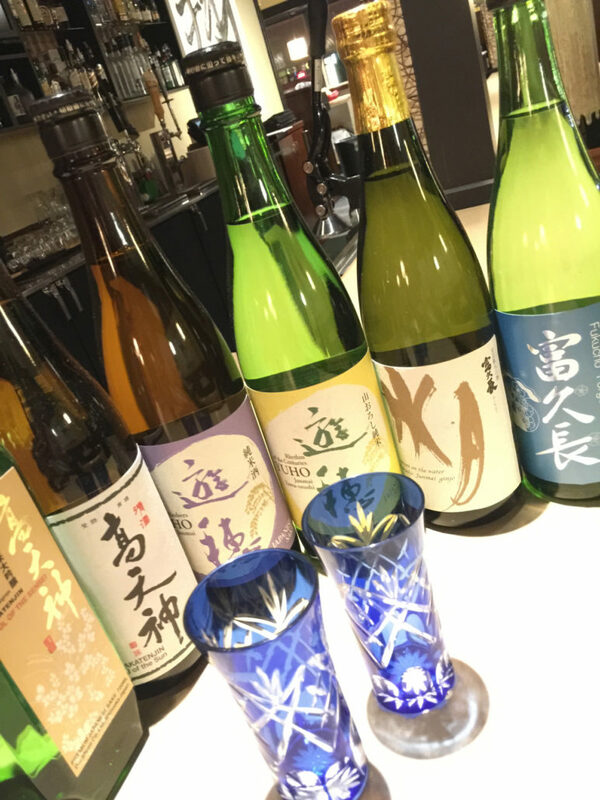 This brewery represents some of the best saké from Western Japan. Chiyomusubi has a rich, smooth flavor. This saké is great for a variety of Japanese foods, tempura, fish, and grilled meats. Brewed by a family owned brewery in Tottori Japan. Fantastic fresh flavor brewed with the famous heirloom rice Omachi. Balanced orchestration of flavor on the palate with a slightly earthy finish. New to Oregon. The “can” saké is very unique. The saké has not been pasteurized so there is a slightly yeasty, spring flavor. Bright fruitiness with an almost hidden gamey finish. The can saké is also slightly higher in alcohol than most saké at 20%. The most unique aspect of this saké is the can container, holding the saké cold for an extended period of time. Nigori saké is cloudy saké. This is unpressed or roughly filtered. This style of saké is generally sweet and has a course body. Sayuri has a tropical aroma, balanced sweetness and smooth finish. Exotic, rich and creamy with boldly complex blend of coconut and spicy citrusy lemongrass. Balanced Nigori with rich flavor that is not too sweet yet retains classic Nigori flavor. Thick and creamy. Plesant bubbly saké has a mild sweetness and acidity. The saké-based sweet plum liqueur, infused with red chili pepper. The bold spicy flavor spreads through your mouth. Hakutsuru is the #1 saké company in Japan, who for over 250 years have provided smooth, earthy flavored Junmai saké perfect as a “warm” saké. Crafted by one of Japan’s top breweries, this specially designed saké is crafted in Japan, but only sold in the USA. Ippongi Hannya Hot Plum, Hakutsuru Sayuri Nigori, SakeMoto and a splash of Grenadine. Eiko Fuki Ban Ryu Saké, splash of Gran Marnier, sweet and sour with a splash of cola on the rocks. Moonstone Coconut Lemongrass Nigori Saké and vodka. Served on the rocks. Hakushika Snow Beauty Saké, triple sec, and cranberry juice. Shaken, served up. Eiko Fuji Honkara Extra Dry Saké, triple sec with a splash of lime juice – shaken, served up. Hakutsuru Sayuri Nigori Saké, milk, orange juice and a dash of vanilla. Shaken, served up with a twist of orange. Moonstone Coconut Lemongrass Nigori Saké, lemon-lime juice, simple syrup and a splash of half and half. Shaken. Hakutsuru Classic Junmai, strawberry puree, lemon juice, Takara Mirin, shaken and garnished with a strawberry. Eiko Fuji Ban Ryu Saké, lemon juice, Takara Mirin, triple sec. Shaken. Garnish with a lemon wedge. Mint leaves, Hakutsuru Classic Junmai, simple syrup, lime juice. Garnish with a mint flower and lime. Hakutsuru Classic Junmai, green tea syrup, HANA Lychee Saké. Shaken, served up, garnish with a lemon peel and mint leaf.